Want to make some cash within 30 days? "How Would You Like To Be Able To Attend A Virtual Live Seminar From The Comfort Of Your Own Home And Learn Our 30 Day Formula Money Making Secrets?" Recruit JV partners to help promote your products. Learn new strategies to move your business forward. Find out what is new, what works, and what doesn't. Get your name out there and really start making some money. 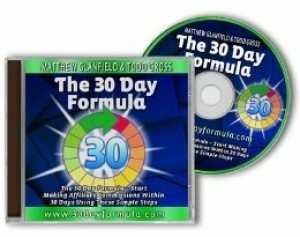 The 30 Day Formula taught beginners like yourself how to make money within just 30 days using only a squeeze page and an auto-responder.